Who’s ready for a big bowl of flavor to kick of the end of summer? I can’t believe it’s the end of August already…I’m loving the warm Manhattan days and slipping on flip-flops and sunglasses without winter coats and scarfs and boots and mittens. Who’s with me on that? Summer is so much easier, isn’t it? It’s so peaceful and relaxing…. Longer summer days means more daylight and everyone appears to be so much happier than when we’ve got 2 feet of snow in Manhattan. Ha. 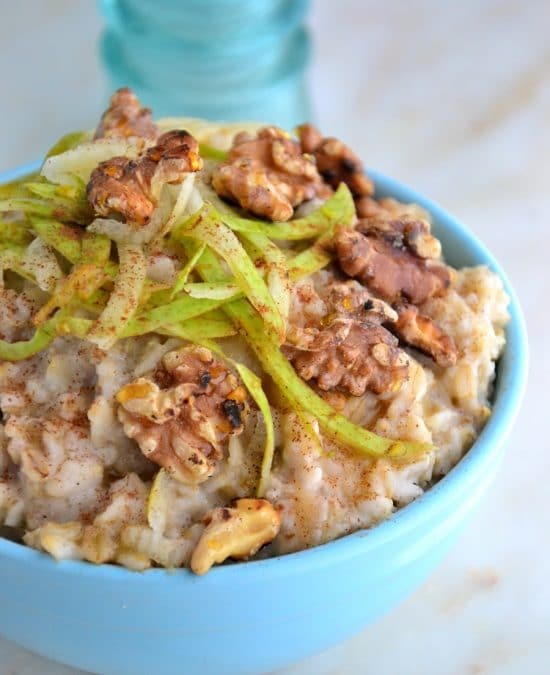 Anyway, let’s circle back to this beautiful bowl of goodness that I’m obsessing over lately. 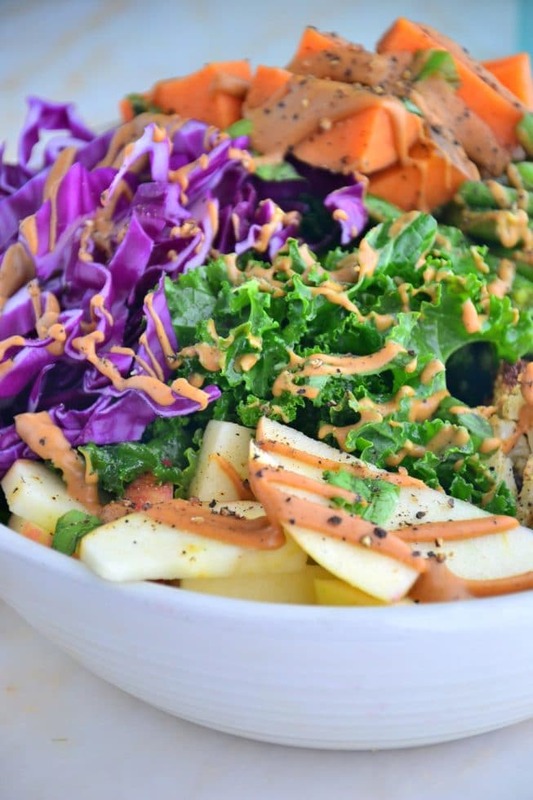 It’s full of good-for-you veggies that pack a ton of fiber and nutrients as well as a nice dose of protein in this amazing almond butter dressing. I’m kinda over creating exhausting salad dressings (and I was never a fan of store-bought dressings) so I opted for drizzling my creamy almond butter on top of everything this summer. Yes everything. 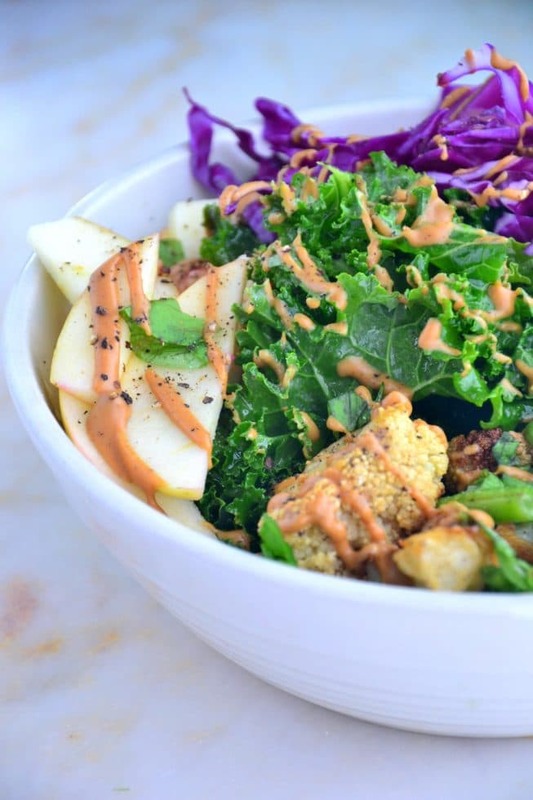 I have a feeling this love affair with almond butter dressing will flow well into the fall and winter for me. It’s so comforting and satisfying. Wanna know the worst part about eating salad? When you finish it and you’re still hungry. Ew. Like who does that? Isn’t that the worst. What I’ve realized throughout the last 2 years of balancing my hormones is that my body needs MORE healthy fats for my blood sugar regulation, cortisol regulation and overall hormonal health. When we don’t eat enough fat, it stresses our body out and our cortisol (the fight or flight hormone that packs on the stubborn fat that you can’t loose) spikes. So unlike what most of us learned in the 80’s and 90’s eating low fat and fat free foods, adding in MORE healthy fats is the way to go. Trust me I’m living proof. I just found out last month that my THYROID is normal on my blood work for the first time in over 10 years. Isn’t that amazing! I am so delighted and it just goes to show that if you give your body rest and relaxation, start saying ‘No’ to things in your life that no longer serve you or make you feel good, take care of yourself and eat fresh, wholesome foods and good fats (because bad fats are inflammatory), then your body starts to heal. It’s like magic! And so is this pretty summer Buddha bowl. Dig in, have fun and remember, life’s too short to deprive yourself. Don’t waste your time focusing on the foods you can’t eat–there’s no need to fear what food can to do you! I want you to shift your perception and look at what all of these amazing foods you CAN eat (more in my cookbook below) and see what these foods can do FOR you. Now that’s looking on the bright side of life, wouldn’t you say? And if you haven’t had a chance, check out my yummy cookbook which is packed with information on inflammation and detox that you can start just in time for the fall season. 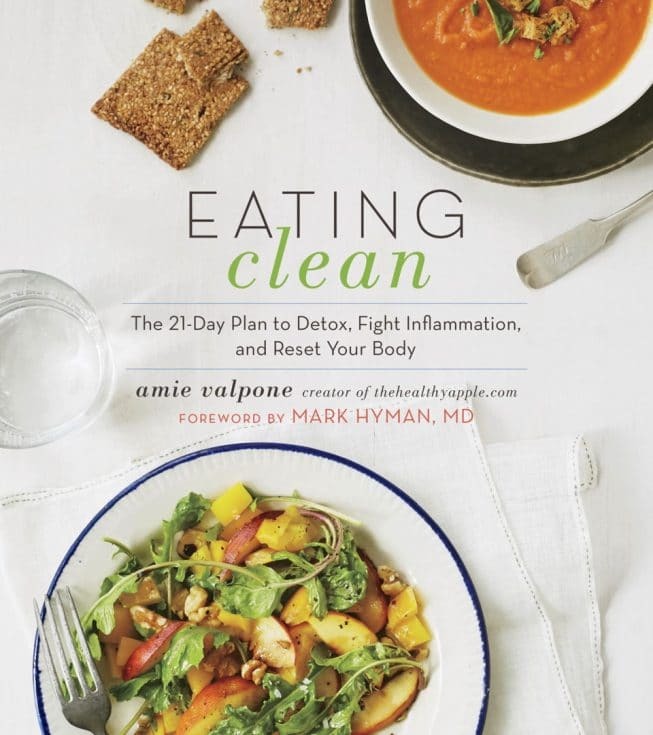 Eating Clean: The 21-Day Plan to Detox, Fight Inflammation, and Reset Your Body. For more of my favorites, follow me around my kitchen and Manhattan on facebook, pinterest, instagram, twitter and google plus. Free of gluten, dairy, soy, sugar, eggs, corn. Vegan and Vegetarian. Poke holes in the sweet potatoes. Then, place the sweet potatoes on a rimmed baking sheet and roast for 20 minutes. Remove from the oven and cut the sweet potatoes into 1 inch cubes. 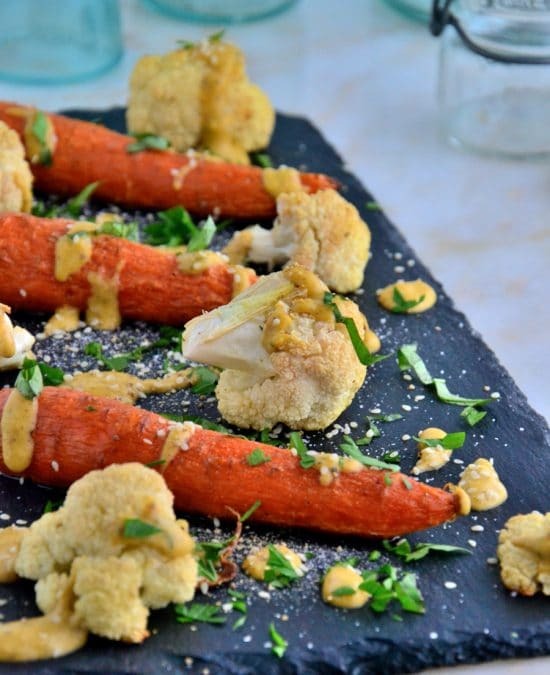 Place the cauliflower on a rimmed baking sheet with 2 tsp. olive oil and toss with sea salt and pepper. Roast for 20-25 minutes then remove from the oven. Meanwhile, steam the green beans in a small steamer basket on the stove over medium-low heat for about 10 minutes or until tender. Remove from heat. 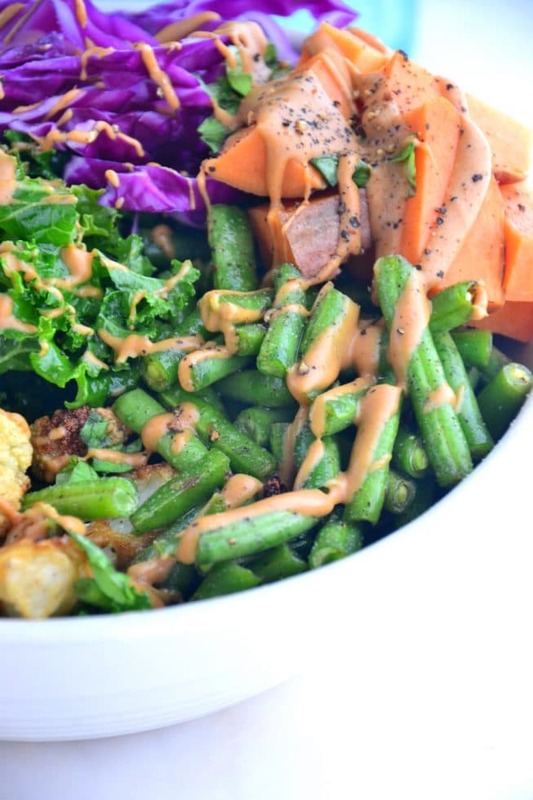 In a large bowl, combine the roasted sweet potatoes, cauliflower and steamed green beans. Add the kale and massage the chopped kale with your hands with the remaining 1 tsp. olive oil. Add the cabbage and apple. 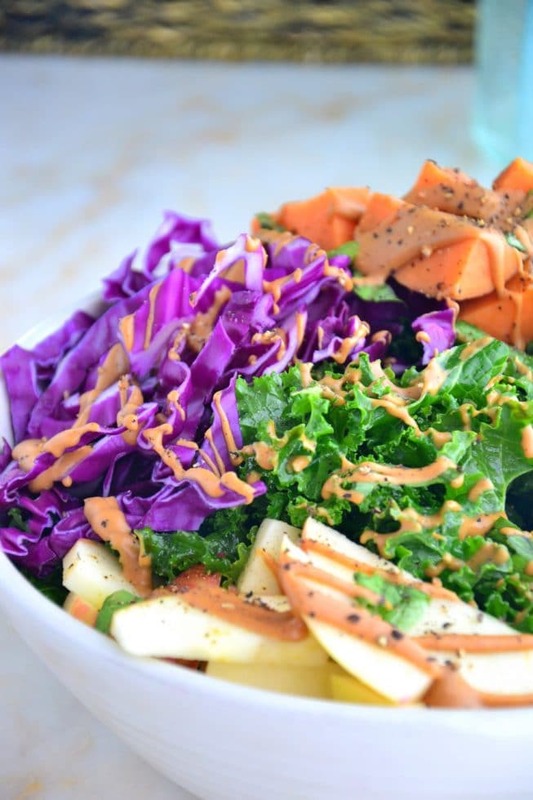 Drizzle the salad with the almond butter and lemon juice. Add lemon zest, sea salt and pepper. Serve immediately.